A select few of us gathered for a double session at the latest Mathematical Association conference. Attention was drawn to two actions involving squares. Start with two or more squares drawn side by side in a line (on the left below). Now use the long edge to form a square adjacent to all of the first squares, and perhaps extend that to several more squares of the same size, again in a line (here only one square was drawn in the vertical direction). Now use the longest edge to form a line of new squares adjacent to the previous square and one of the squares before that (here only one square is shown, to the right). Carry on this process for a while. Now count the number of squares of each size that you have used. 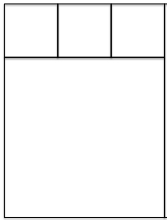 This sequence is a ‘statistic’ in that it summarises the process of forming the final rectangle. Can you use the statistic to work out the proportions of the final rectangle? For example, if you start with two squares, then add just one at each stage, stopping after say 4 stages, then your statistic will be [2, 1, 1, 1], and the rectangles, as they grow, will be 1 by 2; 2 by 3; 3 by 5; 5 by 8 so the final rectangle will be 5 by 8. 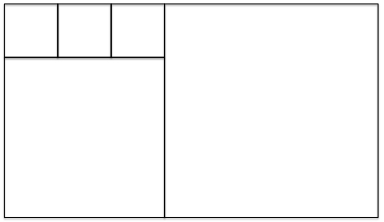 Start with a rectangle with integer sides. Cut off the largest square you can. Keep doing this until you finish with a square. Now record the number of squares of each size. Given the original proportions, can you deduce the statistic, the sequence of numbers of squares of each size, without actually doing the square-removal? Participants experimented with one or other and then both of these actions, experiencing how one was the undoing of the other. Eventually after some work and juggling with how to record these action sequences to our satisfaction, we were able to relate them to continued fractions. The second phase was to generalise. Instead of removing squares, the idea is to remove the largest rectangle possible with edges in some given ratio, say 2 : 3. The initial question is how the ‘statistics’, the sequences of numbers of rectangles of each size, relate to the square removal we started with. Very strange things emerge, though we hardly got to them. In the case of continued fractions (square removal), it turns out that if you start with a rectangle whose sides are in the ratio √2 : 1, then the process never stops but you get a repeating sequence of terms in your statistic, and this happens whenever the initial rectangle has sides in the ratio of an irrational square root of an integer. With rectangle removal, even with rationally proportioned rectangles and a rationally proportioned removal rectangle, sometimes the action terminates, sometimes it repeats, and sometimes it appears to go on forever. This suggests the notion that two ratios of integers might be considered to be differently related according to whether the process terminates, repeats or goes on forever! Students might find it attractive to work on square removal (or square build up) as something to explore that involves revision of fractions, but which might be more interesting than simply adding and subtracting various fractions for practice. Working on rectangle removal might give them a taste of what it is like to explore unknown mathematical territory, and to see mathematics as a creative endeavour. An app for displaying all this is available upon request. Please comment below if you would like to be sent information.